With the Equipment Rental feature, an administrator can manage and keep track of all rented equipment in the store. 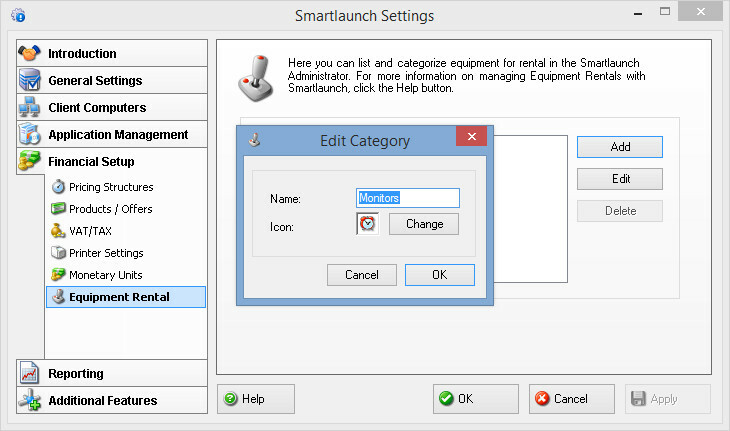 There are some steps you need to follow in the Smartlaunch Server and Administrator in order to use equipment rental feature. 4. Once you have a category you can enter all equipment that belong in that category. Click Add >> Equipment to see all available equipment. 5. 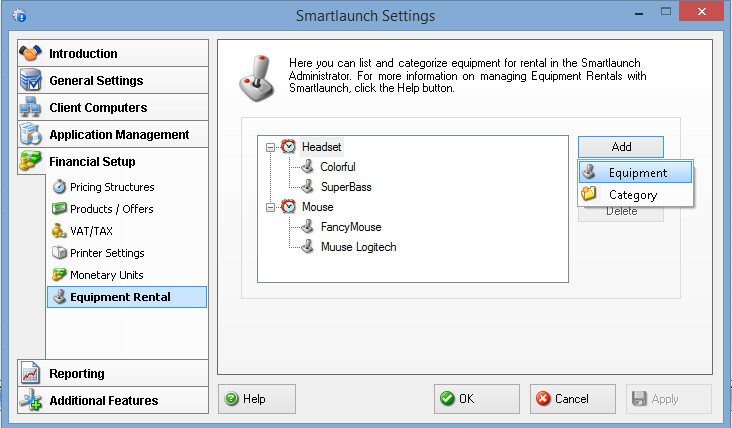 Alternatively, you can enter the name of equipment and then choose which category each equipment belongs to. You can also enter a barcode for each equipment item for easy scanning on checkout. Click Apply to Save. 6. 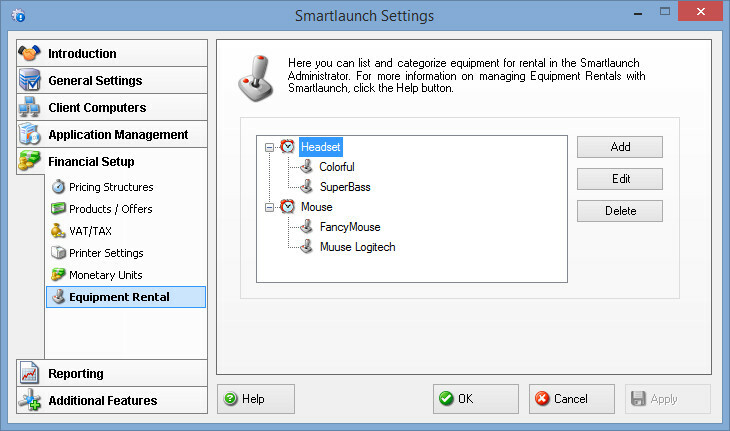 Setup your equipment one by one until all available equipment is listed in each category. 1. 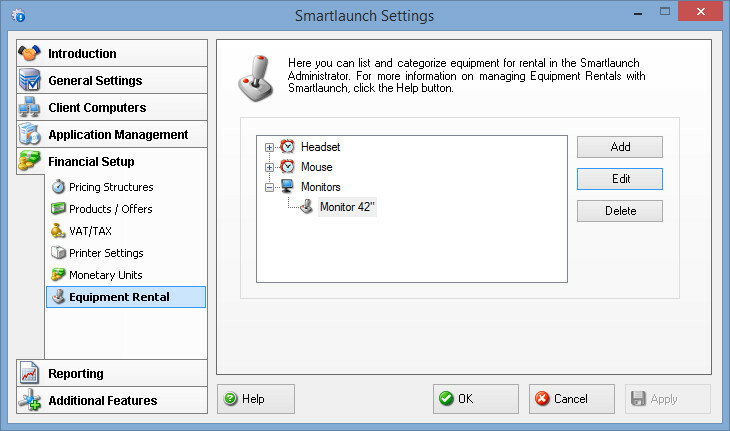 Open the Smartlaunch Administrator >> click on Equipment Rental button (the new icon that looks like a joystick) in the top menu of Smartlaunch Administrator. 2. 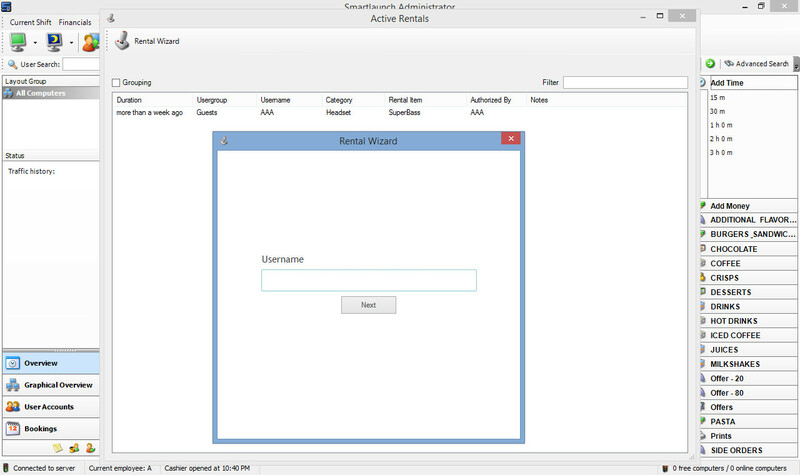 The Active Rentals form will be displayed as below. It will list all the equipment rented in your store. 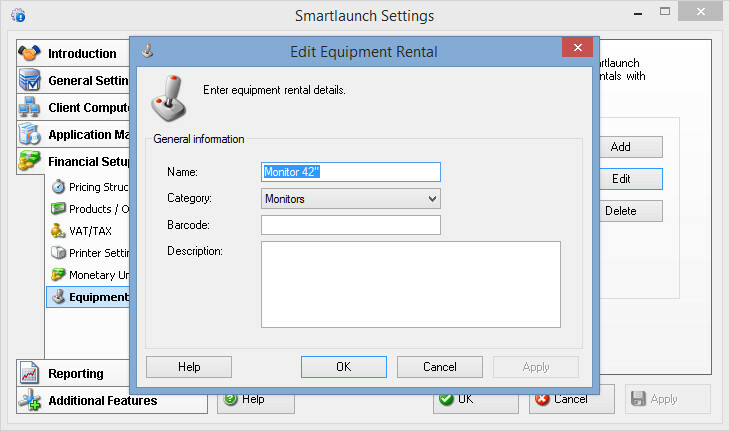 Click on Rental Wizard icon to start using this rental feature. 3. 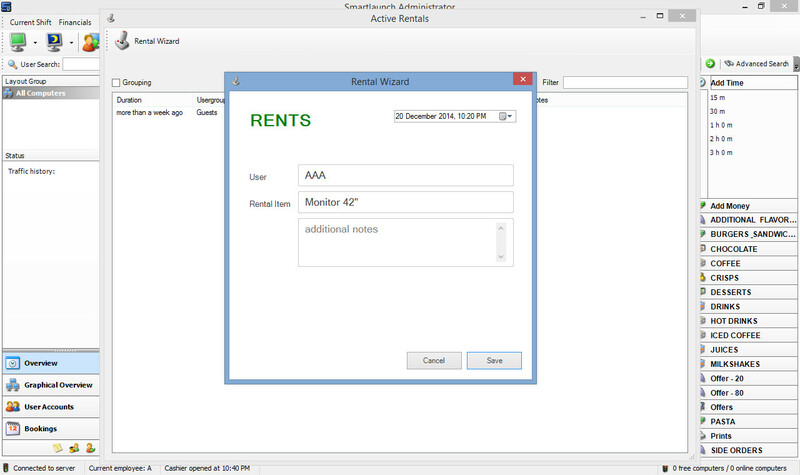 Rental Wizard form will be displayed where you enter the username of the person who wants to rent the equipment. 4. Next, scan or input the rental item barcode. 6. 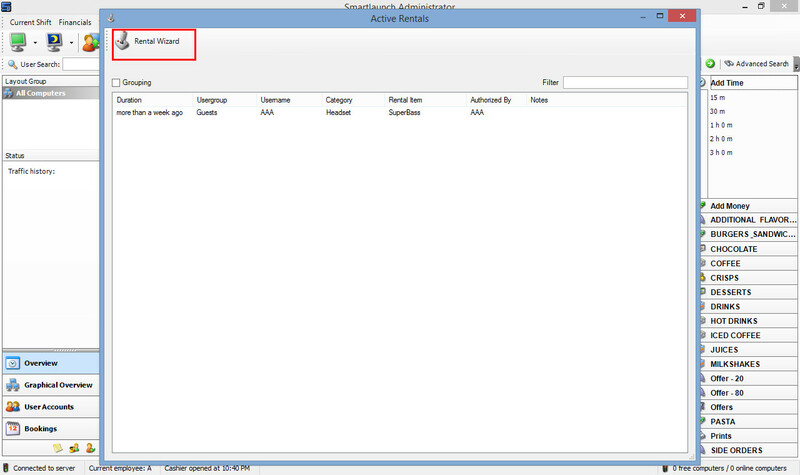 Once the user has finished the rental, the administrator should close the status. 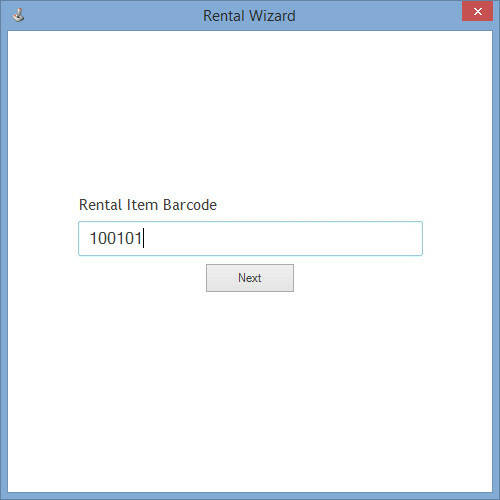 To return a rental, re-run the Equipment Rental wizard by inputting the username, and then click Next to input or scan the equipment. 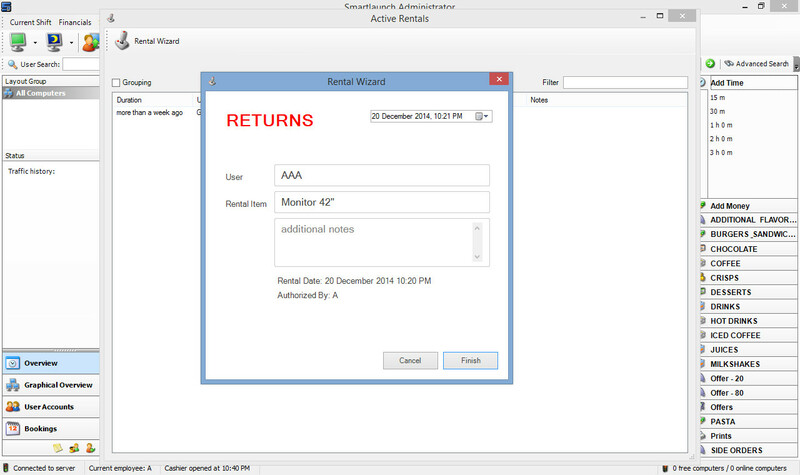 You will then see a RETURNS screen instead of a RENTAL screen.